A couple of days ago, me, Beloved, and Hannah had dinner at Glorietta’s Food Choices. The particular stall we ordered at was the Go Greek! one at the relatively newly-opened corner. It’s been a while since we actually had a reason to go to Glorietta, and the last time I ate at Food Choices, this place was still under renovation. The look, feel, and menu of Go Greek! reminded me of a Greek-specialty version of now closed down Koryo. 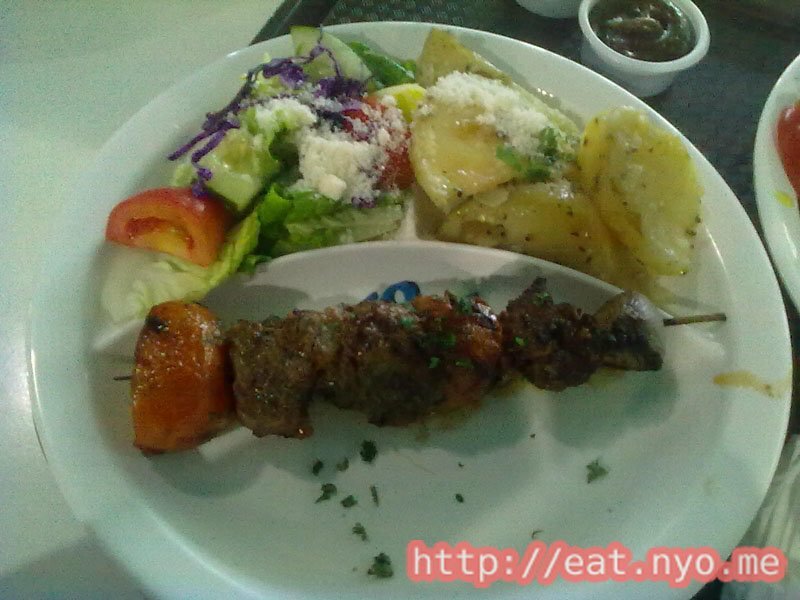 Their platters provide a main viand with the meat of your choice plus salad and your choice of rice or potatoes. The prices are similar to the compared resto, and the serving sizes, which we got a sneak peek at since it was a food court, were similar as well. Anyway, since I’ve already gotten a fresher course on Greek food, I went with my favorite one—their Gyro Platter (235 Php), choosing mixed meat over simply lamb or chicken. 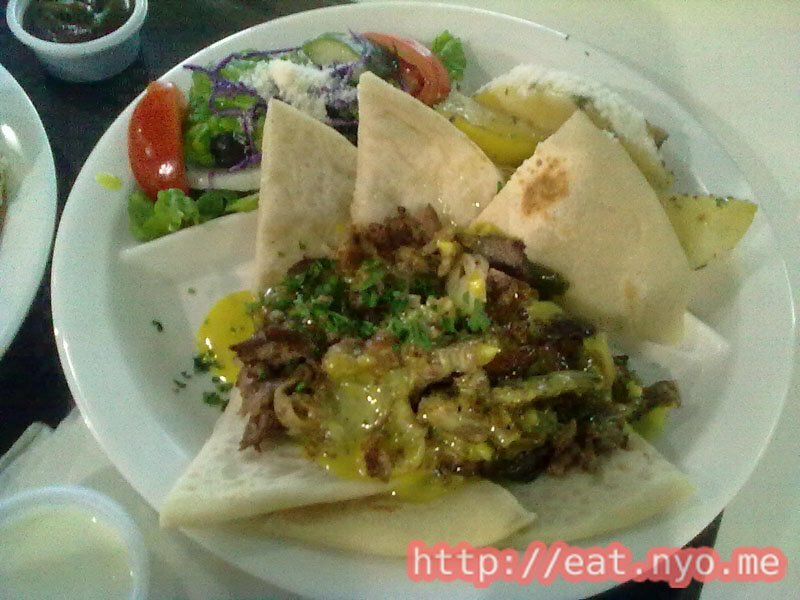 Beloved and Hannah both ordered their Kebab Platter (205 Php), with Beloved choosing seafood and Hannah choosing lamb. 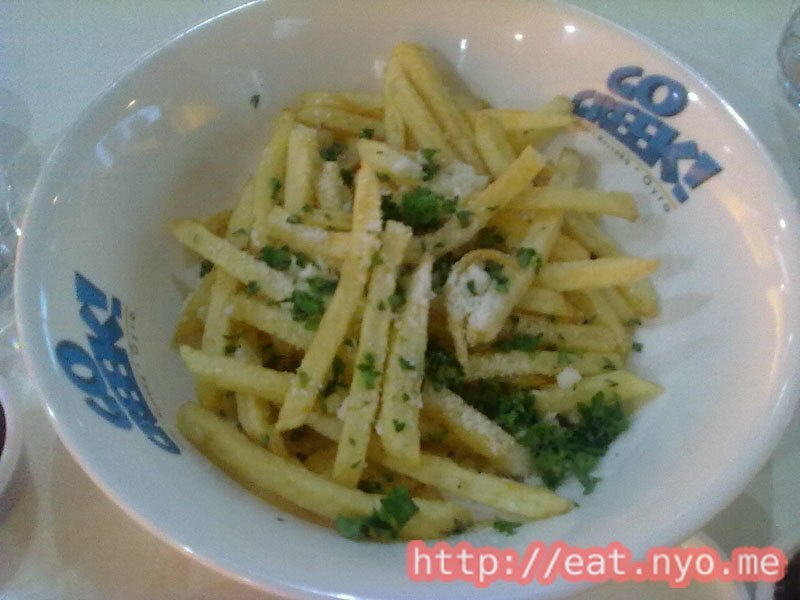 Finally, because it was very tempting for me, I also ordered their Greek Fries (75 Php). Hannah and my orders were instantly available. The fries and seafood had to wait for 10 minutes. So my Gyro Platter wasn’t really what I expected, which was a pita sandwich similar to a shawarma. Instead, it had grilled meat over pita bread. I guess the only difference is the presentation. The meat involved here are chicken and lamb. While the latter is indeed tastier, it’s very, very tough, which sums up my complaints to the meat portion of this dish. The yogurt sauce was a welcome accompaniment to the already tasty meat mixture. As for the sides, I loved the salad, especially having the Greek twist of black olives and feta cheese. The potatoes I didn’t like as much, as it was a bit too bland for my taste. Hannah’s Lamb Kebab Platter received similar complaints to the lamb portion of my mixed meat gyro. It was very, very tough. After the wait, Beloved’s Seafood Kebab Platter proved to be the winner of our orders. I’m not sure what fish was used, but it looked and tasted like tuna to me. And unlike the lamb, it wasn’t at all tough, it was done just right. Also, unlike me, Beloved loved the potatoes for some reason. I tasted hers and it was the same. Finally, their Greek Fries was a bit disappointing. It wasn’t the crispy, twice-fried fries I love. Instead, this was a once-fried potato strips topped with feta cheese and parsley. It was okay for the taste, but certainly not for the texture. All in all, I’m pretty torn what to give this place. True, their food is tasty, and aside from my complaints to the toughness of the meat, there really wasn’t anything not worth the price we paid. However, there’s also nothing worth praising for the price we paid. What bothers me more is that it’s located in a place where you can have tastier food at a lower price, and the fact that you can smell these tastier choices from the other stalls while you have your relatively higher priced meal that doesn’t smell as good. Still, I guess the reason why Koryo closed down was because it should’ve been done in a place like this. I guess if you’re craving for grilled meat with a Greek twist, or perhaps a complete meal with something differet, Go Greek! is an okay place a try. Just, try not to order their lamb unless you’re ready for some hard chewing. 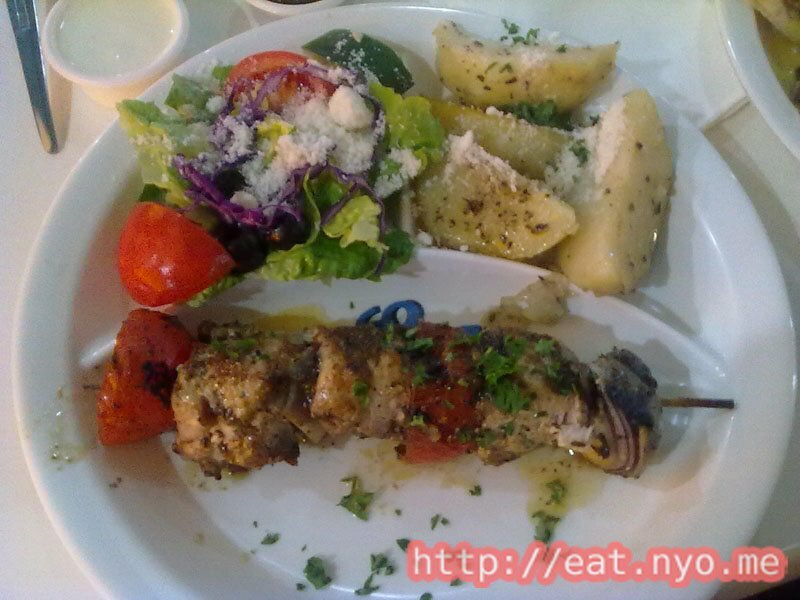 Recommended for: Greek food lovers. Smart nomnomnom tip: Try not to pick their lamb.